I first visited England in summer 1961 at the age of sixteen, during the school holidays. It was quite common at the time for English families, ideally with children, to take in youngsters from Germany and other foreign countries for a few weeks, as paying guests. My host family comprised a vicar and his wife, with their young daughter who was coming up for five years old. They lived in an idyllic Cotswolds village, Church Enstone, in Oxfordshire. The four weeks I spent there enriched my life. Not only did I improve my schoolboy English and become more fluent, but the family took me with them on their shopping trips in their plush Morris Minor, usually to Chipping Norton. On Sundays, the family and I attended the village church together. We all went to watch the motor racing at Silverstone, picnicked in the country, and the vicar showed me Oxford University and explained about its colleges. What impressed me most were the many conversations that the Reverend Hubert, to call him by his first name, then in his mid-forties, carried on with a rather wet-behind-the-ears teenager. as he himself put it, had focused his concentration more on the spiritual than on the physical. The parishioners – who visited us, or whom we visited – and the congregation in church always displayed an aura of love and devotion, but also respect, for their vicar. I still admire him today for how he and his wife managed the not-so-easy duties of an English country clergyman. During my stay, I also learned something about Englishness and even about the English class system, although this knowledge was more sensed and intuited than consciously understood. At the vicarage, my first milestone in understanding Englishness came with the Test Match between England and Australia. The whole family, including their young daughter, closely followed the game on a new television set. Since their guest from Bonn clearly did not have a clue about cricket, the host explained the rules to me with a touching display of patience, including such enduring mysteries as LBW. This cricket novice listened intently as the vicar skilfully commentated on the game. He straightforwardly concluded that the Australians would win, as they were both bowling and batting better than the English, an assessment with which I dutifully agreed. Fortunately, comments in the opposite direction are allowed. If a foreigner praises certain features of England, the English are pleased, although they will immediately play down the merits of what has been admired and claim that it is actually not so great. of my stay, the bishop of the diocese came on a visit. I still remember being impressed by his black cassock and the large amethyst ring he wore. On the day before he came, the vicar and his wife gave me a lesson in good manners – something they had never previously done. One point they explained to me was the two-cup rule of tea-drinking: a single cup was deemed impolite, as not enough; three cups were considered impolite, as too many. I was also kindly advised not to engage the bishop in conversation myself, but to wait until he spoke to me, and to address him as ‘Bishop’, rather than Mr Johnson, or whatever his name might be. When the tea came, it tasted quite different from usual and I did not enjoy it at all. I repressed the urge to ask if there was something wrong with the tea, but posed the question about the drink’s strange taste once the bishop had left. ‘It was Chinese tea,’ the vicar’s wife explained. When I asked why it was different from the tea we otherwise always drank, I heard for the first time in my life that it was ‘because of the bishop’. My second experience of the English class system was when my host family and I called on a local landowner, the parish’s most esteemed personage. Sir John, as we shall call him, was an imposing man, approaching 70. At the time, I was very interested in ships and sea battles – as boys sometimes are – and particularly in the Royal Navy. I could reel off the order of battle and course of events at the Battle of Trafalgar. When we arrived in the entrance hall of the large and rather grand residence, I spotted on the opposite wall a painting of a scene from the 1916 Battle of Jutland, details of which were well known to me. There was the briefest silence before we proceeded to take tea and scones. Afterwards, Sir John asked me how I recognised the scene in the picture, and I told him about my interest in the Royal Navy. He signalled to me to follow him and we entered a room full of English naval memorabilia. It transpired that Sir John had fought in the Battle of Jutland. For nearly a whole hour, he described the events and his role. I was eager to know whether he had known the English admirals, Jellicoe and Beatty, personally. It was an hour suffused with mutual affection between old and young, with never a word out of place, and certainly no nationalistic undertones. I remember it clearly and vividly to this day. On the way home with my hosts, the mother complained about Sir John’s unconventional behaviour, having neglected the adult guests and spent so much time with a youngster. I do not recall the word ‘class’ being spoken on these occasions. But, somehow, they left me with the indelible impression that, beyond the vicar’s family and villagers, other spheres existed where different habits and standards applied. I had caught a whiff of class. These summer holidays were the beginning of a lifelong fascination and affection for England that has led to many visits, many, many books and finally to my own place there, not far from the spot where my English ‘career’ began. In summer 2015, my wife and I were travelling through Gloucestershire and Oxfordshire. By chance, our route took us through the small village where my old host family had lived. Memories flooded back; so it was an easy decision to visit the village, its vicarage and church. The couple would probably no longer be alive, but perhaps someone would remember them. Standing outside the vicarage, I felt too shy to ring and ask the new occupants about the fate of their predecessors. But, in the church, someone showed us a roll of past vicars, and there was the name of ‘my’ vicar, and his dates in office, from 1959 to 1971. And that was the end of that – until mid-2016 and the Brexit referendum, David Cameron’s resignation as prime minister and the process to choose a successor. 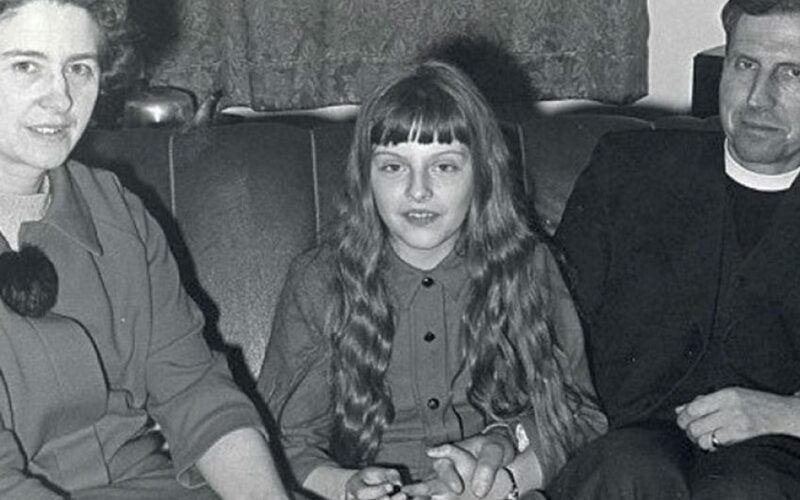 The candidacy of Theresa May spawned widespread reporting about her background and early life. And only then did it become clear to me how small the world really can be. For the idyllic village in the Cotswolds was Church Enstone, and the vicar and his wife were Hubert and Zaidee Brasier, although he always called her Mary. Sadly, I then learned that Hubert Brasier had been killed in a car accident in 1981, and his wife died the following year. And I also learnt what had happened to their young daughter. She was called Theresa – today known to every Englishman and woman as Prime Minister Theresa May.